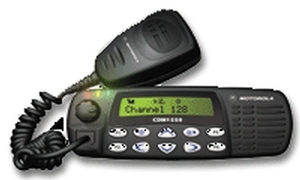 The CDM1550 mobile radio is no longer manufactured, however accessories and replacement parts may be available. Please contact your Motorola representative for additional information. The CDM1550 mobile two-way radio is equipped to handle the needs of organizations requiring high levels of flexibility and functionality. An extensive range of signaling capabilities enables text messaging with dispatchers to minimize channel usage, or discreetly signals for emergency help even when the vehicle is turned off. X-Pand audio enhancement and a powerful front-projecting speaker ensure clear, crisp sound, even in noisy environments. The alphanumeric display utilizes user-friendly icons helps make information easy to understand. Operates on choice of 128 channels. Exchanges text messages between base and user. Discreetly sends a help signal to predefined person or group. Alerts users to incoming messages, even when away from the vehicle. Weight: 3.15 - 3.50 lbs.